When selling expensive merchandise, attention must be paid to the overall presentation. 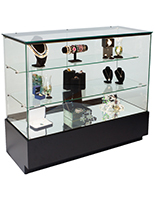 Jewelry display counters need to look as good as the items enclosed inside. The overall perception is very important. 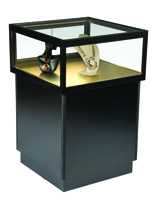 Patrons would be suspicious if your selection of diamonds and Rolexes were put inside a cheap-looking showcase. 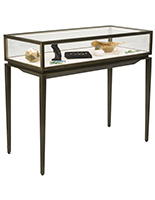 Our jewelry display counters offer the quality and presentation any upscale proprietor would be proud to place in their store. Customers who spend large amounts of money expect the best. 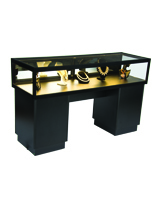 As a jewelry store owner, presenting with the best counter displays should follow suit. 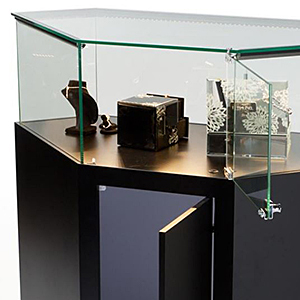 What are the finer points of these high-quality showcases? 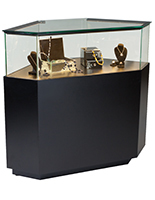 Our jewelry display counters are predominantly "quarter vision" designs. These cabinets feature top-level spaces for displaying your items. 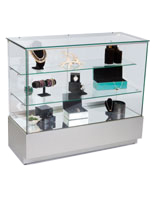 By raising merchandise up from the floor, your patrons won't need to crouch down for viewing. 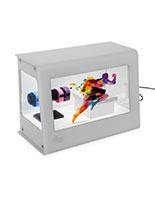 An added advantage to this design is the rest of the case can be used for out-of-sight storage. 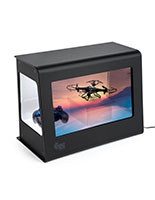 Unsure what makes a quarter vision showcase different from a full vision model? 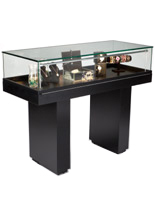 Let our Display Cases Defined article tell you what you need to know! 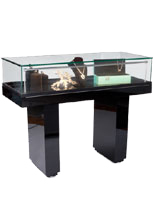 A fine jewelry proprietor knows how important a presentation needs to be. Accent lighting is a necessity. 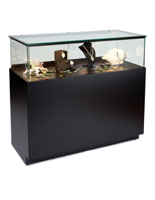 Our display counters come with integrated LED illumination for showcasing your offerings. 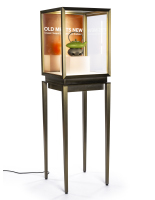 Since light bounces off precious metals and gemstones, an irresistible aura is therefore displayed to potential customers. Presenting your wares is one thing; having them easily accessible is another. 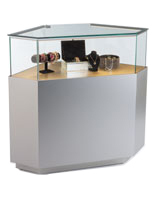 Our display counters feature three ways for access. Choose lockable rear doors that swing open. 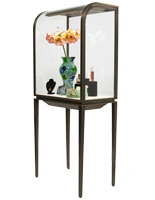 Some models come with sliding glass doors with or without a mirrored surface. A third option is the gas-lift assist. 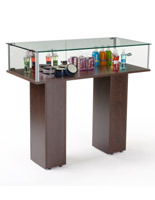 These tables (with the pedestal legs) feature a tempered glass box design which tilts open for access. 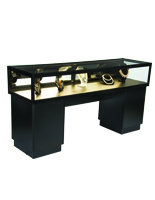 Our jewelry counters are made up of two different series: EuroVu and Grace Tyler. If you are interested in purchasing additional fixtures to create a long cash wrap, simply look for the matching name in the product descriptions above. 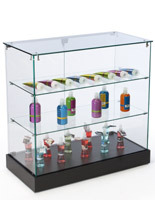 We offer standard counters, table models, and corner units that can be mixed-or-matched together into a modular system. 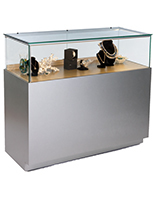 Our mid-range Essentials Series offers tall, freestanding towers and cash register stands as a possible alternative to these deluxe jewelry counters. Either way, small decorative items for personal adornment have been used for centuries. Functional jewelry often aids with holding hair or clothing in place. A personal mark of status, such as a wedding ring, displays visual clues in social settings. Or, a symbol of personal or artistic meaning that provides context to the person wearing it. Jewelry symbolizes lots of things to lots of people. In most cases, considerable thought and expense go into every purchase. Make a customer's shopping experience one to remember!